Keeping your hunting dog warm and dry, especially during the later part of the hunting season, means knowing the signs of cold-related illnesses and injuries and how to prevent them. The stillness of the predawn silence was breached by the sound of frozen ground crunching beneath our wader boots and of soft muffled whispers. Our flashlights found the path into the dark New York woods. Through an early morning mixture of frost and mist our small troupe made its way down the hill towards the hidden beaver pond. The mixture of frozen mud, frost covered leaves and twigs breaking beneath our feet and the sting of the morning air assured me that we would be "cracking" ice in order to set out our decoys spread. The thought of entering that frozen water sent a cold shiver through my spine. The pulling on the end of the lead interrupted my train of thought. My English springer spaniel "Bess" was straining at the bit, in anticipation of the morning’s hunt. I began to consider her well being in these late season conditions. As we approached the pond I could see that my instincts were correct, the pond was iced-over with only a small section of open water near the middle. We could break a path to the open water with minimal effort. However, the thought of my dog slipping under the ice in an effort to retrieve a duck or shivering wet and cold between fights made me reconsider. Neoprene dog vests had just recently appeared on the market, and not having one, I did not want to take the risk. This hunt ended with me bagging several big Canadian greenheads, while "Bess" waited in her crate in the truck. 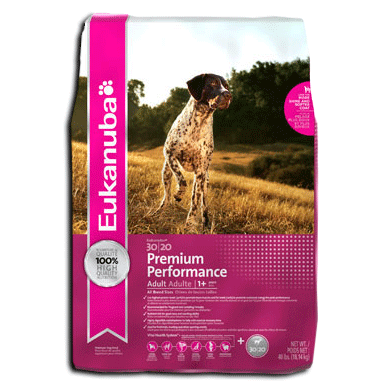 Discretion is definitely the better part of valor when it comes to your dog’s health and comfort. Today all my springers wear camouflaged neoprene vests while waterfowling. The only exception is during September teal and early resident goose season, when the temperatures are still very warm. I also use an old treestand converted for the sole purpose of duck hunting in shallow waters, such as flooded timber. The stand is camouflaged and has an insulated pad attached to in. It acts as a platform where the dog can rest and remain out of the water between retrieves. A camouflaged neoprene vest will help keep your dog warm, add buoyancy and help break-up his outline. An old tree-stand can be converted into dog platforms for hunting shallow waters like flooded timbers, keeping your dog out of the water will help to keep him warm. 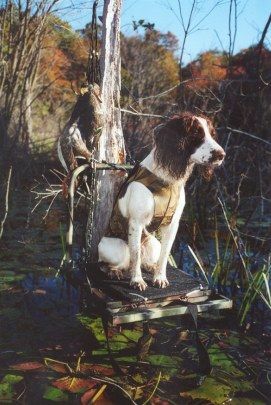 David Krassler, a professional trainer of English springer spaniel believes camouflage neoprene vests are a great benefit to the waterfowlers as they serve several purposes. "Besides acting like a wetsuit and helping to keep the dog warm, they provide extra buoyancy and an added measure of protection against sticks and rocks which can cause cuts, abrasions and punctures. They also help to break-up the dog’s outline, which can often increase your odds of detection by savvy late season birds." Krassler continued, "The biggest advantage a vest provides for the spaniel owner is that it will allow you to extend your season, within limits." Krassler explained that just because your spaniel is wearing a vest he shouldn’t go out and tackle conditions more suited for a Lab or Chessie. Krassler also recommends keeping several towels in the blind with you and drying the dog off between retrieves. "Drying your dog off between retrieves will not only keep him warm and comfortable between flights, but will extend his ability to handle such conditions," Krassler said. Doctor Bryan Morris, DMV and owner of Corban Veterinarian Services in Charlotte Courthouse, Virginia agrees that using neoprene vests and drying the dog off in the blind are very important components to keeping your dog warm and healthy. "Most hunting breeds are not usually adversely effected by cold weather, if they are active and in good physical condition." Dr. Morris continued, "Late season waterfowl hunting can be very demanding on both you and your dog. Cold water draws away the body’s heat and can exhaust a dog very quickly, which could lead to drowning. While some breeds are much better suited for the riggers of cold water retrieves and spending hours exposed to the elements, there are many other factors that also need to be taken into consideration." Dr. Morris explained that many hunting dogs are also family dogs that live indoors and may not develop a full undercoat. "In cold weather environments dogs should spend time outdoors to both acclimatize and develop an undercoat." He continued, "In activities like waterfowling, the dog is subjected to cold-wet environments, he is usually in and out of the water expending energy and calories, then force to remain motionless for long periods of time without drying off. If the dog has not fully developed an undercoat he can be at risk of cold weather injuries such as cramps, pulled and torn muscles or tendons. Putting a neoprene vests on your dog and drying him off in the blind are great preventative measures that will help to keep your dog healthy in adverse conditions."